Last August, in the days before the race at Watkins Glen, Paige and I decided to drive into the campground there at the race track, find a member of the #2Crew, and give away a case of Miller Lite. What made our journey at Watkins Glen a little different was that we decided to film it on Facebook Live. At the time, I’d been trying out Facebook Live a little bit, and thought it might be fun to go out and meet some fans, and share the experience of what that was like. Since then, we’ve done quite a few of these Facebook Lives on race weekends, and they’ve been great. Today, I want to spend this blog entry explaining why I do them, and sharing what I’ve learned about our fans from doing them. (And in case you were wondering, this isn’t some sort of paid ad for Facebook.) I want to pass along why these experiences have meant so much to me, and why I think they’re important for me to keep doing. I’m always looking for ways to engage our fans. I’ve done blogs in the past where I’ve talked about why I’m not the biggest autograph fan—I understand that to some people, an autograph is the Holy Grail, but it’s not to me. 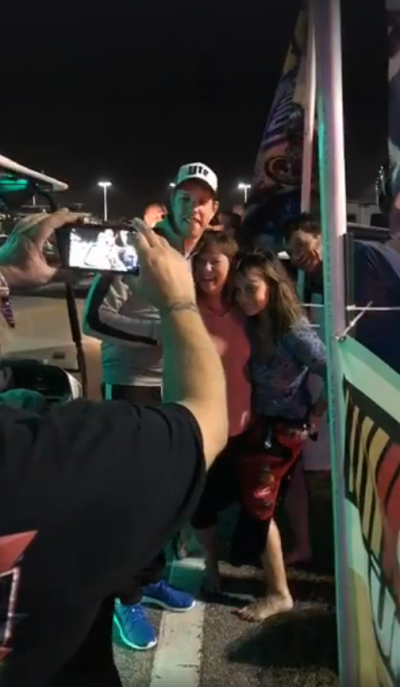 When I thought about what kind of experience would be relatable to me if I was a fan camping at a race track—well, that’s the question I started with, and I kind of moved forward from there. That’s how we wound up at Facebook Live. I would say probably two-thirds of the race weekends, I do an appearance that fans are invited to, but not every weekend. I realize that there are some shortfalls in terms of fans having access. So Facebook Live felt like a really good fit. It was a way to make sure that I felt able to meet with race fans each and every weekend, and show the gratitude I have for them, and everything they do. I’M SO THANKFUL TO ALL THE 2 CREW FANS FOR THEIR SUPPORT, I WANTED A WAY TO SHOW MY APPRECIATION. Most of the time, when it comes to driving out to the campgrounds, we don’t have a plan. Practice is over early, or we’re going to go out to dinner, or we just got back for dinner and it’s still early enough. It’s pretty much as simple as saying, ”Let’s go do something fun and cool.” It’s actually more fun to head out without a plan, and just do it to do it. Paige is my cameraman, and in the beginning, she was very, very nervous about holding the camera the wrong way, that kind of thing. But she’s gotten a lot more confident as we’ve gone along, and I think she’s enjoying it, too. People want to talk to her, of course, and that’s been fun and interesting to see. I think it’s cool to have her filming it instead of someone else. It feels a little bit more personal to our family. When we started, we would ride through the campgrounds, and it was a little bit easier to be incognito. That’s the one thing that’s changed since the beginning. People are starting to catch on. Now fans kind of know that we might be out, so they’re on the lookout, sending me tweets to visit on social media, which is fine. Now we have to find more clever ways to disguise ourselves, and scout things out to find the fans who are showing their support for the 2 Team. It’s important to me that we always stop at someone’s camp who has our stuff hanging up. I want it to be about fans that support us. I want to be able to give back to them and show them that we care. One of the best parts of the whole deal is having it be a surprise when we show up, and so far, it’s been a surprise to each and every person. GREAT FANS WE MET AT A DAYTONA FB LIVE. Another great part is joining fans when they’re enjoying themselves, and simply being part of it. At one of our visits in Daytona, quite a few of the guys and girls had been having a good time, and it’s possible they might not have been completely sober. Those are always kind of fun because people really let their personality show. There was another time—also in Daytona—where a guy got super excited, and started swearing a lot. I definitely appreciated how excited he was, but I was a little bit nervous about all the swearing online. Of course, any time someone gets excited in general, it’s great. If you have a chance to make someone’s day and you’re able to do it, it’s a good feeling. It kind of makes my day, too. More recently, we had a chance to bring Scarlett with us for the first time. That wasn’t exactly planned, either. We didn’t have a babysitter! It was so sunny and bright out, and Scarlett had already taken her nap, so she was in a decent mood. So we figured, “Yeah. Let’s see how it goes.” I think she did great. I’ve learned a lot of things from doing these Facebook Lives. One of the most surprising is how many of our fans are from Canada. I don’t know if that’s just my demographics or what, but even at our past Facebook Live at Richmond, there was a #2Crew group from Canada. If I had to pick the biggest takeaway from doing Facebook Live, though, it would have to be the sense of perspective I’ve gotten. I’ll explain what I mean. When I’m at a racetrack, I’m there to win. My job is to perform. I’m not getting paid to have a good time. What’s going through my head are things like, “How do I get in the corner better? How do I make my car not so loose off? What can I do to get in the pit stall a little better, so the pit crew has a great day?” That’s how we, as drivers, frame a weekend. Because of that, it’s very, very easy for us—and by “us,” I mean all drivers—to lose sight of what’s really going on. And what’s really going on at these races is a lot bigger than our competition. For fans, a race weekend is much more than a race. When you see people in the campground, they’re sometimes there for three straight days. The racing only takes up maybe four or five hours of that time. They’re there to have an experience with their families. They’re there to have an experience with their friends. A race weekend is thousands and thousands of people all coming together for a very unique event, sharing something special, and maybe forgetting their troubles for a while. It reminds me of this great Saturday Night Live Family Feud skit from around the Super Bowl. The skit has people who support the Falcons and Patriots facing off against each other. When asked to name one thing she’d bring to a Super Bowl party, Tom Brady’s wife, Gisele, says, “The beautiful spirit of togetherness that makes all of us part of the tapestry of humanity.” Thanks to her teammate Bill Belichick, who’s hacked the computer scoreboard, it’s the number one answer. Funny enough, that’s exactly what I like most about seeing people come together for a race, and enjoy a weekend of fun. The campground visits are a chance for me to see things in a broader perspective that’s more than just a driver’s view, more than just a competitor’s view. Finally, it’s also a chance to get to know the people who support me, and show how much I value their support. In any business, having a personal touch to what you do seems like a pretty good idea. It’s kind of like the guy that owns one restaurant and knows every one of his customers, versus the guy who owns a chain and never sees his customers. I’m never going to be able to get to the 50,000 or 70,000 fans who show up for a race weekend. I’m never going to be able to sign an autograph for everyone. I’m never going to be able to meet everyone of them at a trailer and give them a case a beer. But if I can do it for one, or two, or three, and show people that I care, and that it could be them, I think that’s a good thing. Now some of you reading this might be wondering: What is it exactly that I’m looking for when we visit a campground? What makes us stop? How do we decide which fans we visit with on Facebook Live? It’s more of an art than a science, really, but I will say this: A couple of weeks ago, we saw someone flying an American flag above their campground, and right below it, a flag with the 2 on it. Now I’m not saying I’m Batman, but when I saw that—that American flag/2 flag combo—it was pretty much like someone putting out the Bat Signal to me. #2Brad, I really enjoy watching they way you interact with Fans, I Really enjoy Seeing the way little kids act. They get so excited.. I heard them talking to one of their friends..must have had RV nearby. 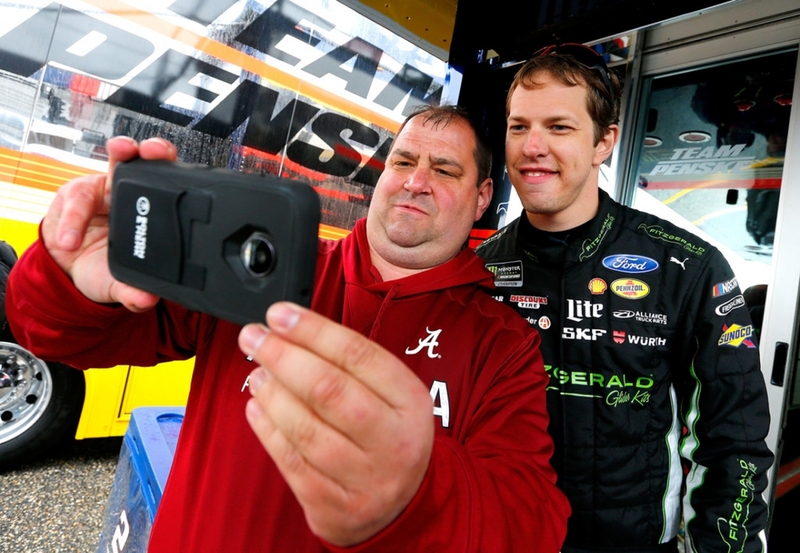 “Was that Brad Keselowski? Yeah, they just drove up to say hi” Really..”and Guess what? “We got Our picture taken with him!” He’s niceThis is for Paige..You do a GREAT job, and Scarlett is a cutie!